We all dream of having hair as long and voluminous as that of the Disney princesses we grew up watching. Remember Jasmine’s thick black hair from Aladdin or Ariel’s flowing red locks in The Little Mermaid? Well, now you can finally turn those dreams into reality. 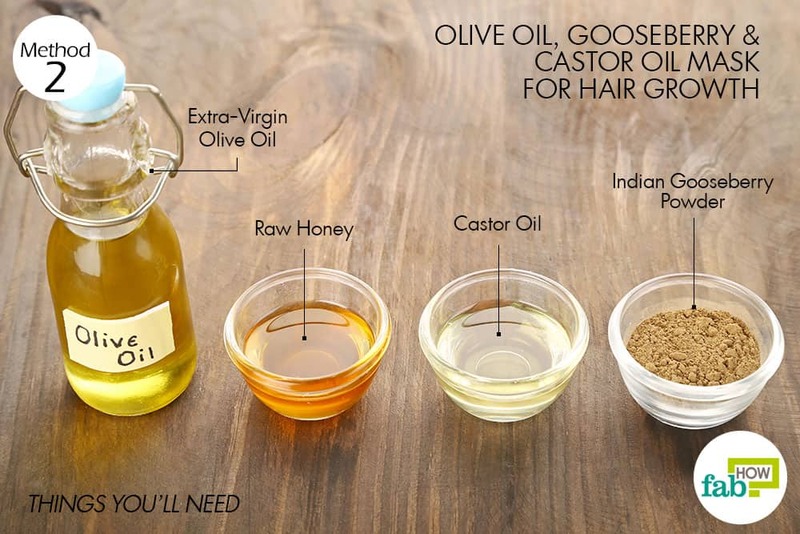 We have come up with 6 best olive oil hair masks that, with diligent care and use, will give you stunning hair. The vitamin E in olive oil helps improve your hair’s elasticity to give you soft and bouncy hair, while also preventing hair loss from breakage. Since the oil works to restore your scalp’s health and deeply nourish the hair follicles, it boosts hair growth and prevents hair loss by strengthening your hair’s roots. Due to its moisturizing properties, olive oil also helps alleviate symptoms of dry or itchy scalp. Furthermore, it is an excellent remedy to tame frizzy hair. Along with hydrating each hair strand, it also gives your hair added luster and volume. Whether you have straight hair or corkscrew curls, olive oil suits all hair types, making your hair soft and glossy for a rich, vibrant look. The quantities used here are for shoulder-length hair. You can increase or decrease them, as needed for your hair length. 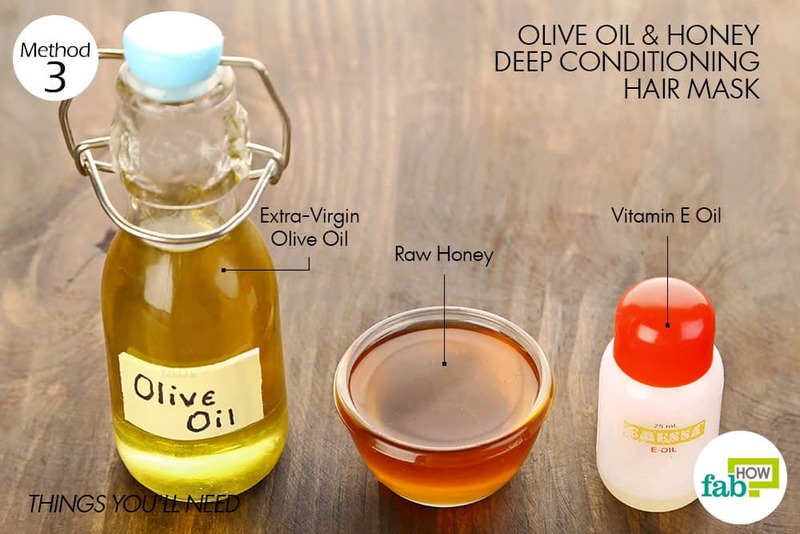 Without further ado, read on and try out these olive oil hair masks that will fix all your hair issues. 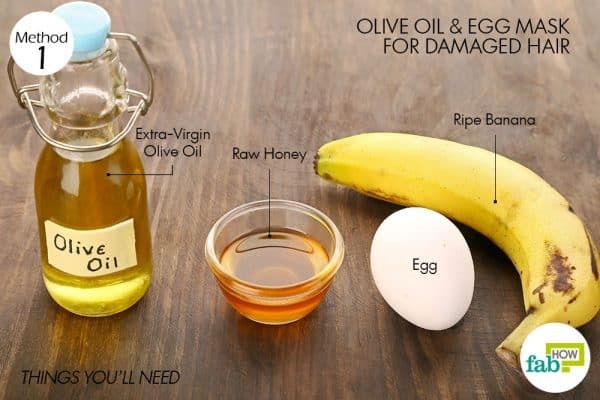 You can whip up a highly nourishing mask for intense hair repair by combining olive oil with rich hydrating ingredients like bananas, honey and eggs. Eggs are a rich source of protein, fatty acids and biotin that boost hair growth and also help repair damaged strands. Honey and banana further nourish and hydrate your damaged locks, making them soft, shiny and thick. The mask will replenish your dry and damaged strands. 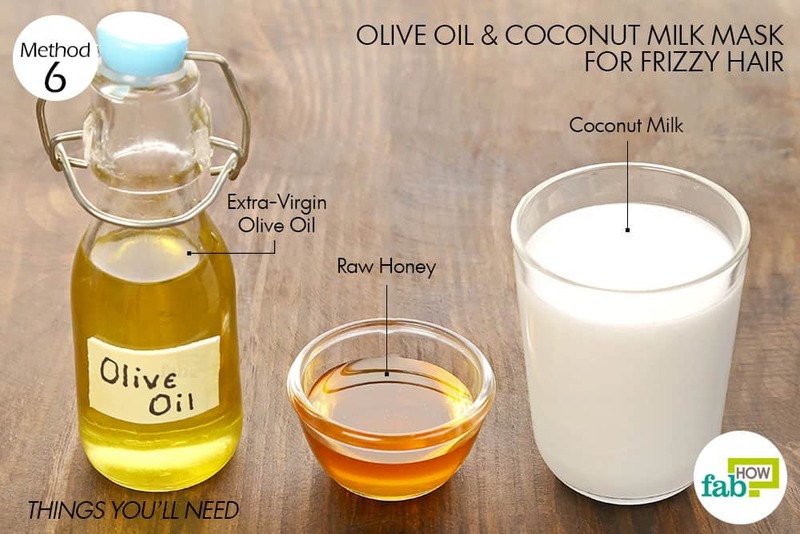 It also nourishes your scalp and is recommended for those who have a dry or slightly itchy scalp. This mask also works to repair split ends. Peel and chop 1 banana into pieces. Use a fork to mash it into pulp. Crack an egg and add it to the mashed banana pulp. Add 1 tablespoon of raw honey. Add 3 tablespoons of extra-virgin olive oil as well. Use a small hand blender to whisk all the ingredients together into a smooth puree. 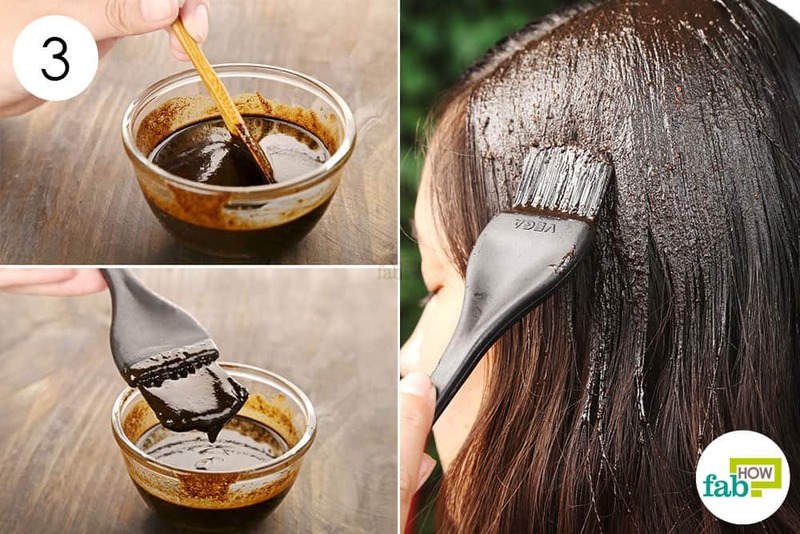 Use a wide hair dye brush to apply the nourishing mask on your hair and scalp. Leave it on for 15 to 20 minutes. You can put on a shower cap to avoid making a mess while it sits in your hair. Afterward, wash the mask out with lukewarm water and a mild shampoo. You can apply conditioner as well to seal in the moisture. 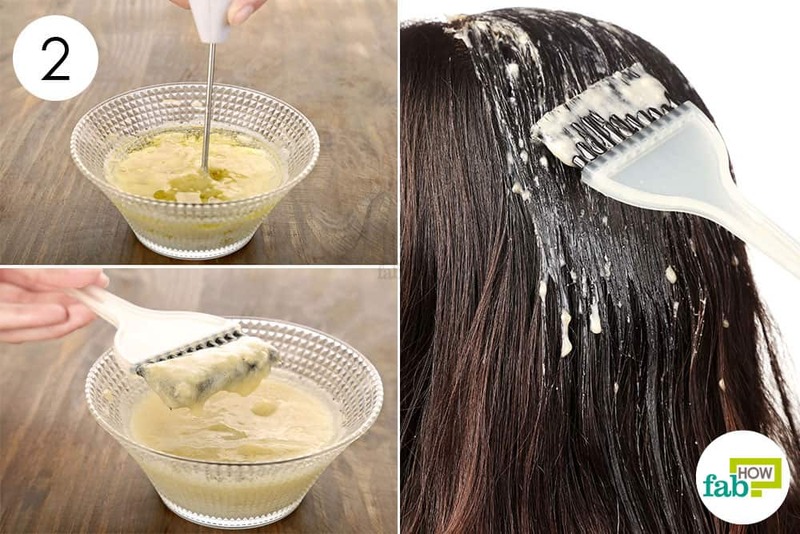 Apply this rich hair mask once a month to repair and rejuvenate your dull and damaged strands. Amla or Indian gooseberry is a wonderful ingredient to boost hair growth, as it improves blood circulation in your scalp, fights free radicals and strengthens your hair roots. You can also use Indian gooseberry to prevent premature graying and drastically reduce hair loss. The castor oil in this mask restores the natural pH and oil balance of your scalp, thereby boosting your scalp’s health, reducing hair loss and promoting hair growth. 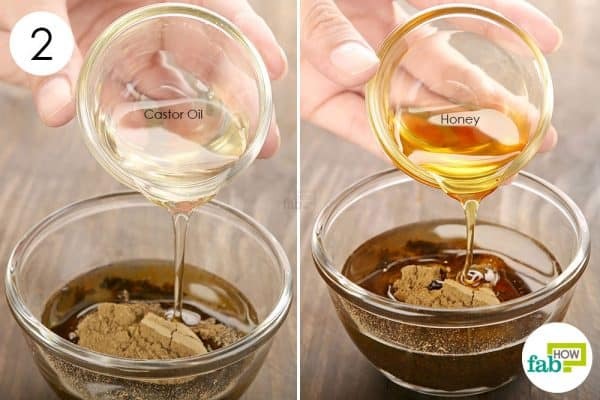 By combining these two ingredients with nourishing olive oil and honey, you can prepare a deeply nourishing mask to boost hair growth. 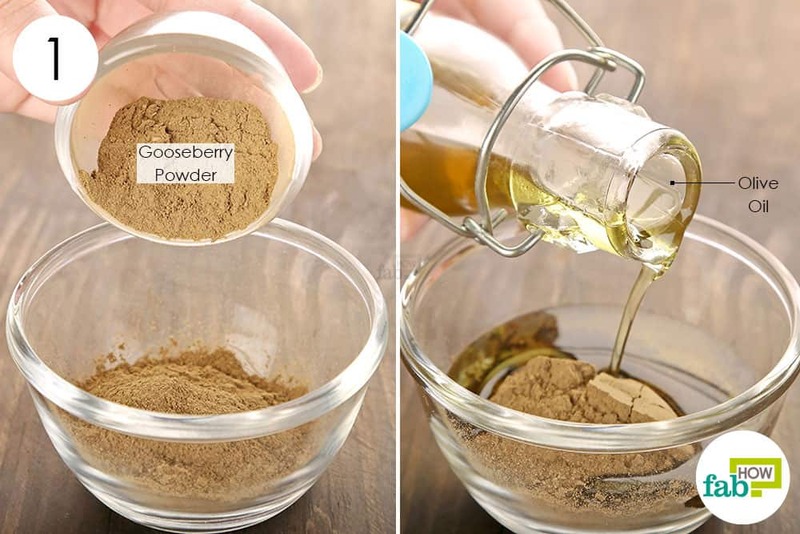 Put 1 tablespoon of Indian gooseberry (or amla) powder in a mixing bowl. Add 1 tablespoon of castor oil. Mix well using a wooden spoon to get a uniform blend. 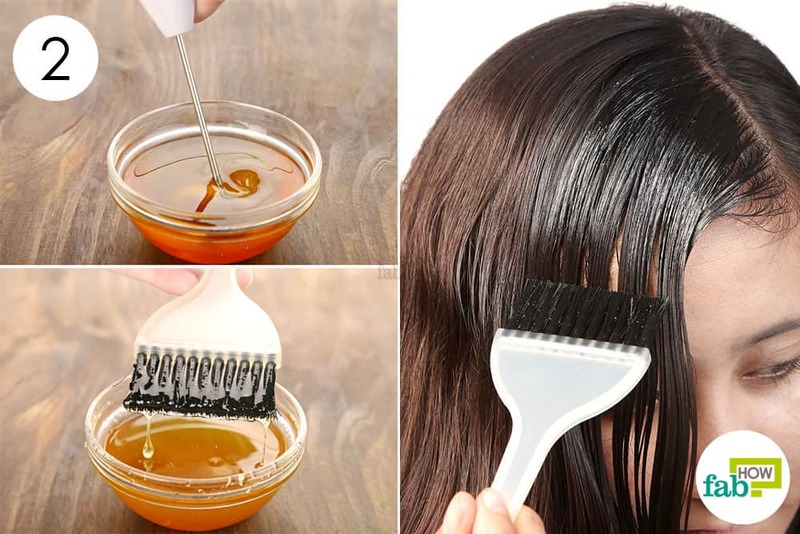 Using a hair dye brush, apply the mask on your hair, covering the strands thoroughly. Put on a shower cap and leave the mask on for 20 to 30 minutes. Afterward, rinse your hair with lukewarm water and wash it with a mild shampoo. For dry hair, apply this olive oil hair mask once a week. For regular hair, apply it once a month to get long and strong hair. This deep conditioning hair mask combines the nourishing and moisturizing properties of olive oil, honey and vitamin E oil to hydrate and enrich your locks, giving you salon-like smooth, sleek and shiny hair without the resultant damage or cost. Vitamin E oil nourishes your hair and scalp, repairing and rejuvenating dry, brittle strands. This in turn enhances hair elasticity and prevents hair loss due to breakage. Honey acts as a humectant to lock in moisture. 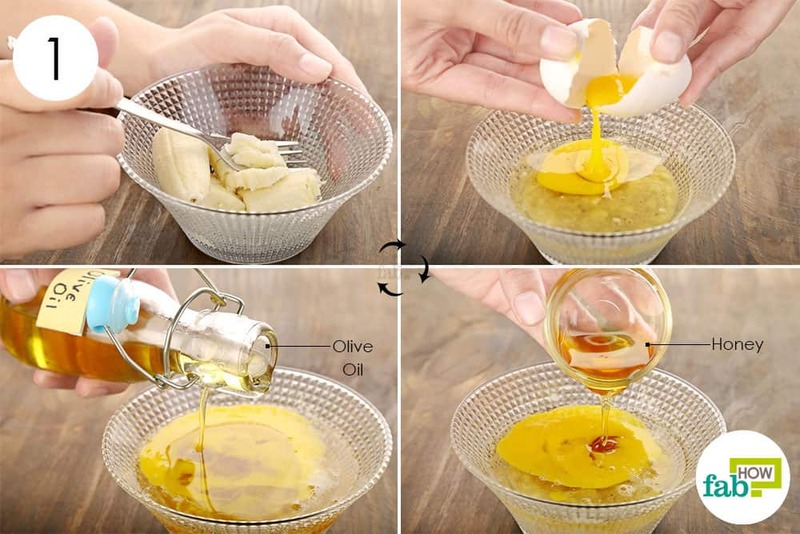 Put 3 tablespoons of extra-virgin olive oil in a bowl. Add about ½ teaspoon of pure vitamin E oil. Whisk thoroughly to get a uniform blend. Apply the mask using a dye brush, coating your strands completely from the roots to the tips. Roll up your hair and put on a shower cap to avoid creating a mess. Keep the mask on for about 30 to 90 minutes. Afterward, wash it out using a mild shampoo. You can use a conditioner to lock in the moisture. To condition and nourish dry and damaged hair, apply this mask once a week. 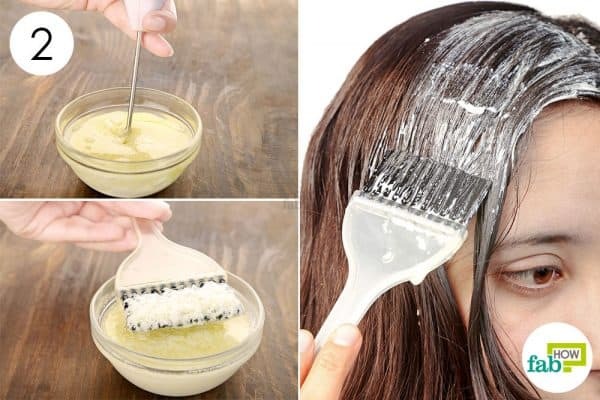 For regular hair, use this mask once a month for deep conditioning. Lemon juice contains vitamin C that promotes hair growth, while its antifungal properties help clear up dandruff and cure conditions like dry or itchy scalp. 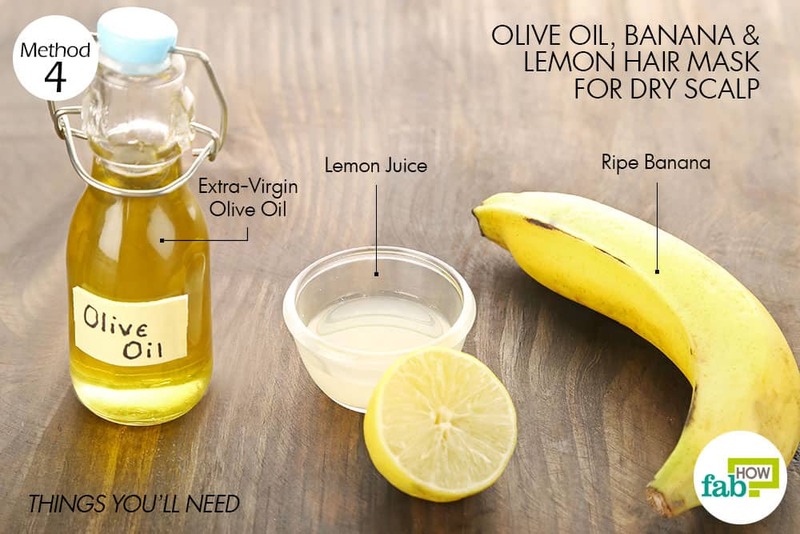 Another benefit of this mask is that the olive oil and banana will help nourish and hydrate your hair strands thoroughly from the roots to the dry or damaged ends. Use a fork and mash 1 ripe banana in a mixing bowl. 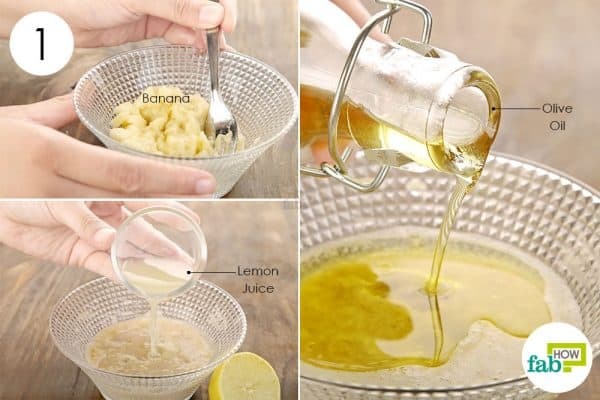 Add 1 tablespoon of freshly squeezed lemon juice. Add 2 tablespoons of extra-virgin olive oil as well. Using a small motorized hand blender, whisk everything together into a smooth mixture. 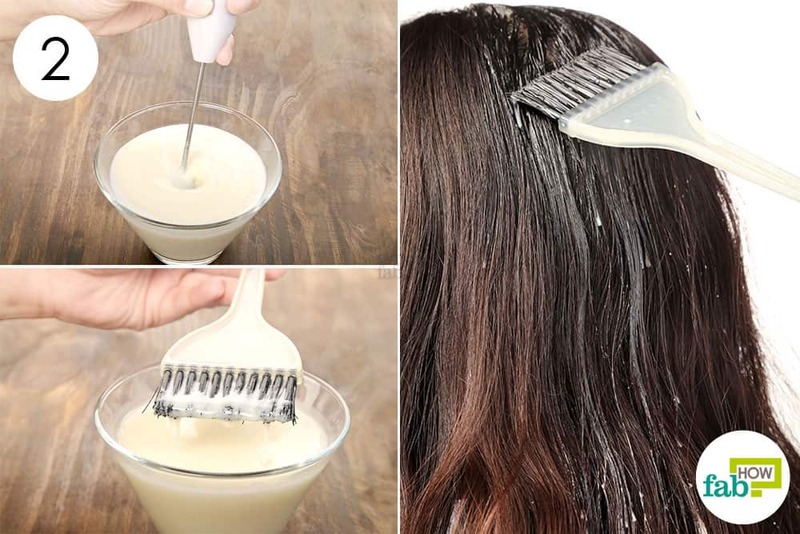 Use a hair dye applicator to apply the mask on your hair, ensuring full coverage from top to bottom. Rinse it out using cool water, and apply conditioner to lock in the moisture. 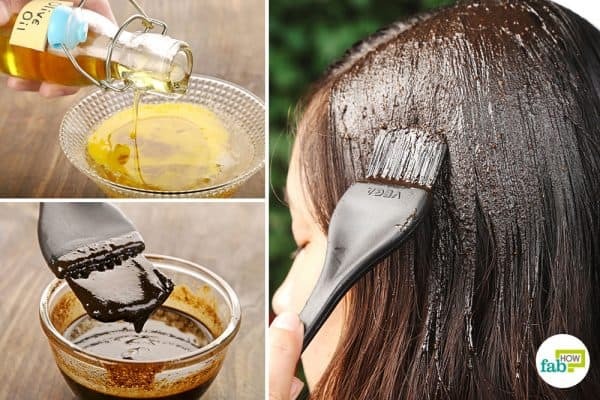 Apply this olive oil hair mask once a week for at least 1 to 2 months to get rid of a dry scalp. Were you swept away by the latest hair coloring trends and now find yourself with dry and damaged hair accompanied by dull or fading hair color? Well, your troubles are over. 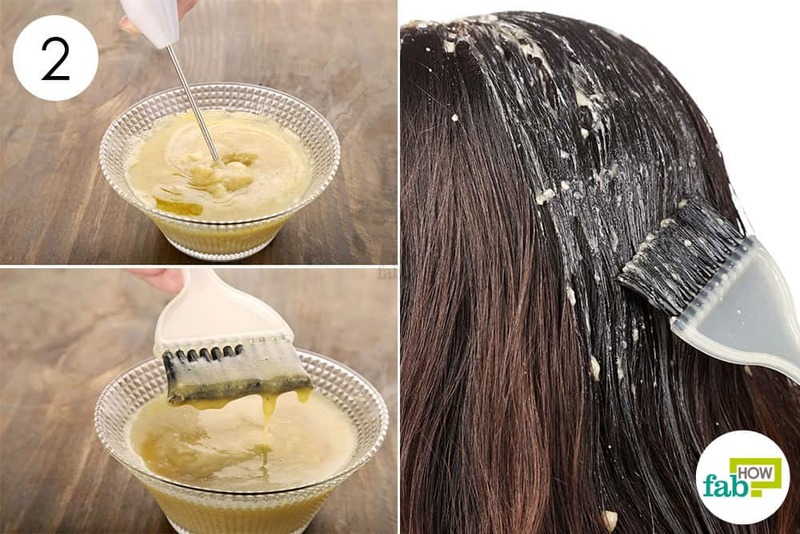 This intensely nourishing hair mask will help restore your hair’s health and further bring that expensive color job to life. This DIY mask for colored hair combines olive and coconut oil with full-fat yogurt for deep conditioning. Full-fat yogurt is rich in fatty acids and proteins that deeply nourish and condition your hair, restoring the shine and intensity of your hair color. 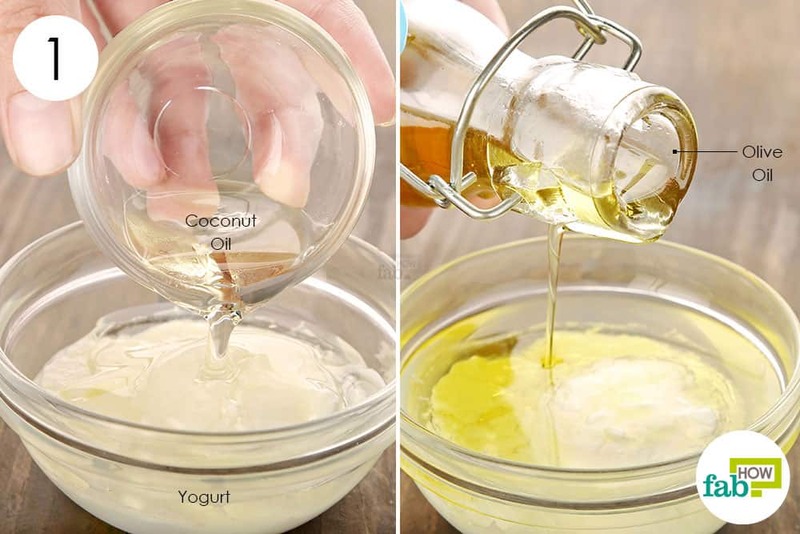 Put 2 tablespoons of full-fat yogurt in a bowl. 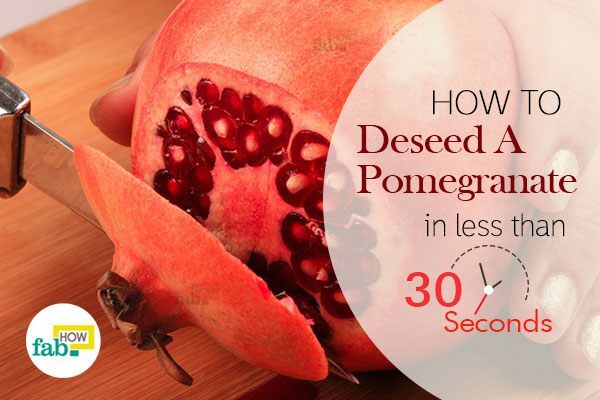 Use a motorized hand blender to thoroughly whisk the ingredients into a smooth blend. Use a hair dye applicator to apply the mask on your hair. Leave it on for about 30 to 40 minutes. You can put on a shower cap to prevent the mask from dripping and creating a mess. Afterward, rinse your hair with water and wash it with a mild shampoo. 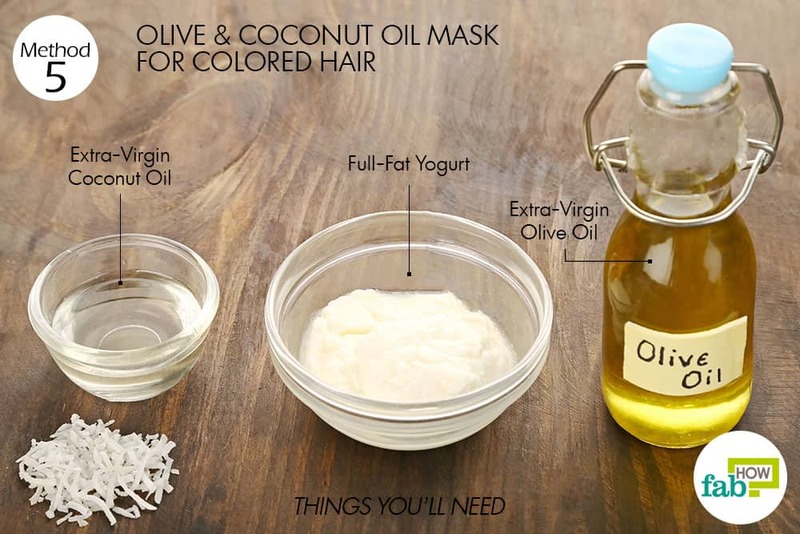 Apply this hair mask once a week to nourish and enhance your colored strands. 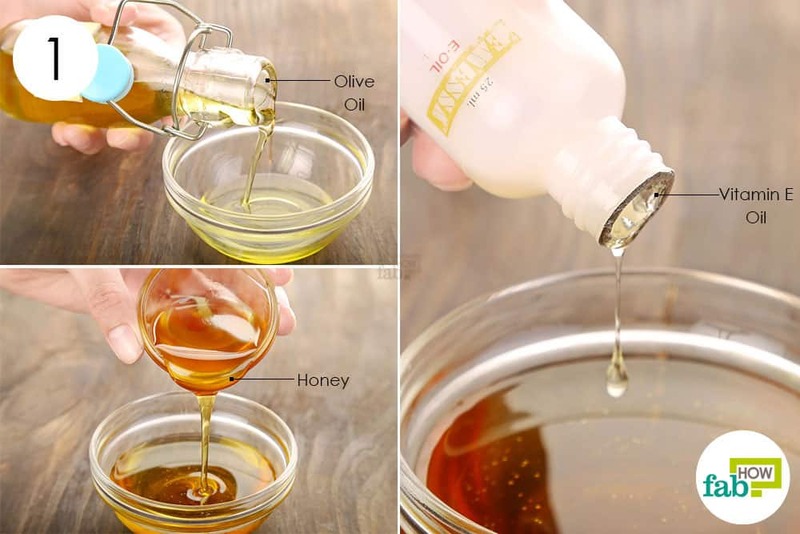 Mixing in olive oil and honey makes a rich hair mask that will give you thick, bouncy hair with regular application. Leave it on for 1 hour. You can roll up your hair and put on a shower cap to avoid creating a mess. Afterward, shampoo and condition your hair as usual. Use this olive oil hair mask once a week to tame and hydrate your hair for a sleek, sophisticated look. To avoid hair damage, do not blow-dry your hair after washing it. Let it air-dry naturally whenever possible. You can also massage extra-virgin olive oil directly into your hair and scalp on a weekly basis to boost growth and repair damaged strands. Just warm up a little bit in the microwave for application and leave it on for between 30 to 60 minutes. 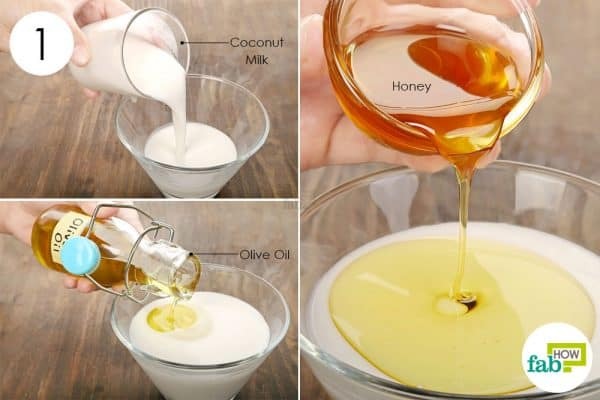 You can also try out DIY hair shampoos to get gorgeous hair naturally.